Our caravan holiday home is just three miles from the coast and the pretty bays of Broad Haven and Little Haven. Enjoy a Pembrokeshire Farm Holiday in our holiday caravan set in a private secluded setting on 20 acre arable smallholding. Sleeps 4 in 2 bedrooms - a twin and a double. £230 to £420 per week for up to 4 person occupation. Meadow caravan is located in the quiet area of Walwyns Castle, in a secluded setting offering privacy and peace whilst being on our 20 acre smallholding which overlooks a woodland valley and fields of cattle, sheep and Shetland ponies. The double bedroom has full sized double bed with side shelves, wardrobe and set of drawers. The twin bedroom has two nice sized beds with central bedside cabinet, wardrobe and shelves. Duvets, pillows and all bedding supplied – beds are made up for your arrival. Blankets also provided. Well equipped kitchen with full-size gas cooker, microwave, toaster and fridge with a small freezer compartment. The bathroom includes toilet, wash basin and enclosed shower with a base suitable to be used as a bath for little ones. 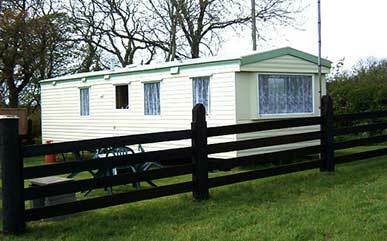 Outside the caravan is a lawned garden with patio set, barbecue set up and rotary clothes line. There is a private paved path to caravan doors from our shared drive. Prices include gas, electricity, bedding and bed linen, with blankets stored as an alternative to the duvets if required and beds are made up for your arrival. Towels are not provided. A deposit of £125 is payable on booking with the balance due 4 weeks before the start of your holiday. Meadow caravan is a non smoking caravan but we are happy for guests to smoke in the garden outside. Bed and breakfast is available with us in our farmhouse.